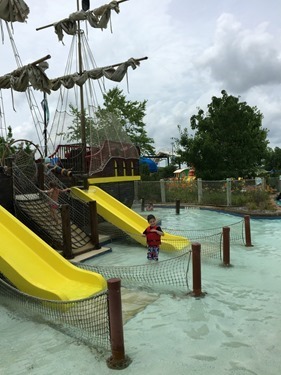 Our weather hasn’t been so wonderful here, but when you have tickets to Schlitterbahn, you have to use them even if it’s cloudy out! 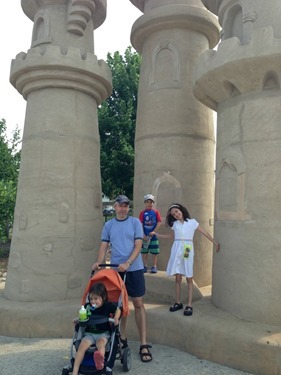 We were all very excited to return to the park after our visit two years ago. We started out at Torrent Cove, the wave pool area that connects to the Torrent River. 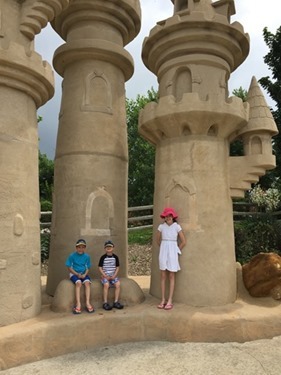 We all got tubes – Simon rode with Dave and Zachary rode with me – and we took our trip around the river, the world’s largest tidal wave river! Waves push you along the canyon for more than 1600 feet. 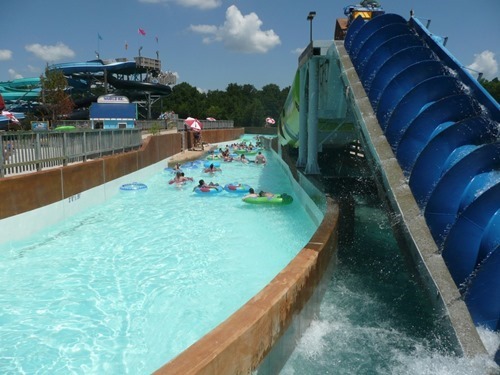 After that, we took the other entrance off of the wave pool into the Krystal River and on to the Mighty Mo rapids river. Everyone seemed to enjoy both of these rides, but they chose not to continue on to the King Kaw River Rapids! 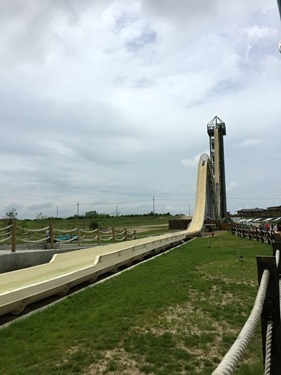 Instead, we exited the river and found ourselves face to face with Verruckt – the world’s tallest water slide! Of course, Dave decided he wanted to go on it, so the kids and I hung out and waited for him to have his turn. Because it wasn’t crowded, the line wasn’t long, but it still took awhile as only 3 people ride at a time. 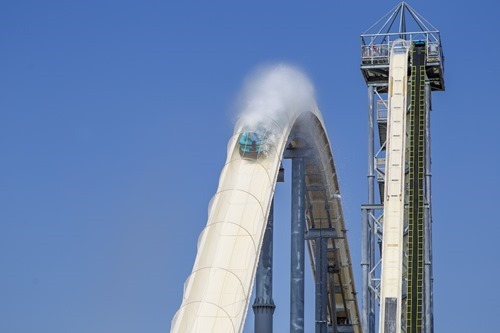 The slide is 168 feet tall and the first drop is equivalent to a 17 story building. Next, you are blasted back up a 55 foot hill. Verruckt means ‘insane’ in German and was featured on Xtreme Waterparks on the Travel Channel! Dave said it was pretty bumpy, but I think he’s glad he went on it! Next, we brought the kids to Simon’s favorite area, Kinderhaven, the shallow water play area. There are nine mini slides here for the littlest park guests! Lifejackets are available throughout the park. 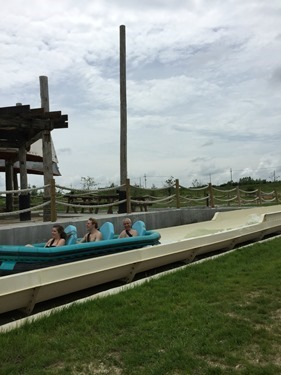 While they did that, I took a ride on the Storm Blaster, the uphill water coaster, which made me scream and realize I’m too old for coasters, water or no water! At the end of the Storm Blaster, you can float over to the King Kaw River Rapids entrance. As I was heading for the conveyor belt that brings you up in your tube to the actual entrance, my tube got stuck and popped! I was scared that I was going to end up flying through the rapids with no tube to protect me, but luckily there was an open area after the conveyor belt and I was able to switch out my tube. The Kaw River Rapids is 3000 feet long and made me sea sick. Like I said, I’m too old for this kind of thing! 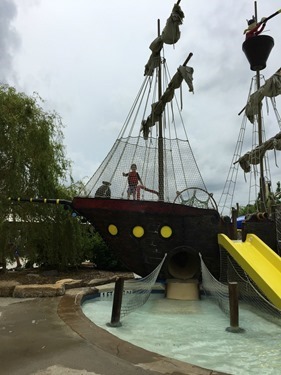 When I got back, the boys and I went over to Henry’s Hideout where they played on the pirate ship and I sat on the side! Meanwhile, Dave convinced Gabbie to go with him on the two rides that I previously rode and she ended up enjoying both of them! Because I did not take too many pictures (the difficulty of a water park! 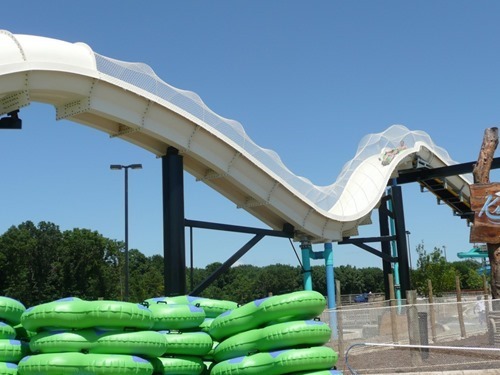 ), here are a few more from Schlitterbahn’s site! The river alongside the Storm Blaster. Verruckt – Would you go on it?! 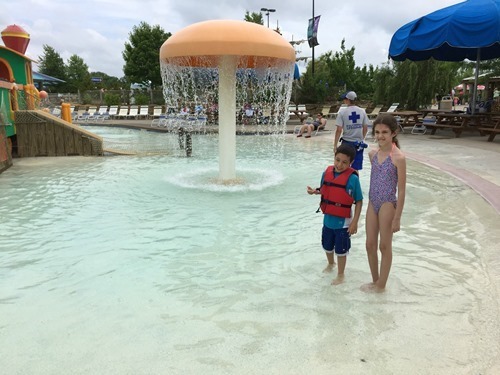 I really love that Schlitterbahn is a fun park for our whole family and that we all had a lot of fun visiting! 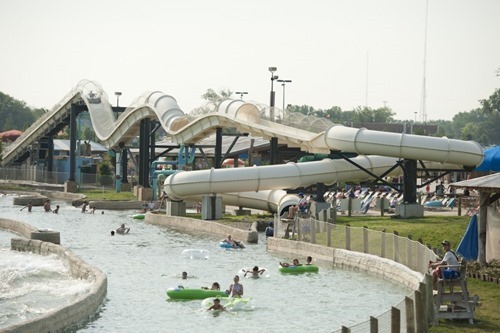 We received tickets to Schlitterbahn in exchange for our review. No other compensation was received and all opinions are my own.